Using music to inspire painting is certainly not a new idea, but is something I have been wanting to incorporate into our routine for some time. However musical knowledge is definitely not my strong point. I can just about fumble my way around simple guitar tunes but have only the barest awareness of classical composers and my CD collection is pretty limited in any genre. It's a weak point I feel conscious of and I would like the boys to grow up an environment rich in music and art. There's all sorts of educational reasons why exposure to these things are important for children's development - from shaky studies into increased IQ (don't get me started on the poor science of the study, the media extrapolation to apply it to babies, or the flaws of IQ testing in general), to links between maths ability and musical practice. Beyond all these 'IQ boosting' claims however I think there is a far deeper reason why music and art are important. Music and art (and maths and dance...) are important ways in which we seek to understand the world around us and communicate our feelings, ideas and knowledge. For children, who are just starting to develop their ability to understand how they feel and express it, this exposure to and participation in art and music is particularly important. The teacher-speak used to describe a child's ability to understand and express their emotions and display empathy for the feelings of others is 'emotional intelligence'. For a child (or an adults) happiness and success in life emotional intelligence is just as important, of not more so, than traditionally measured academic intelligence. The activity we did today is extremely easy to replicate. 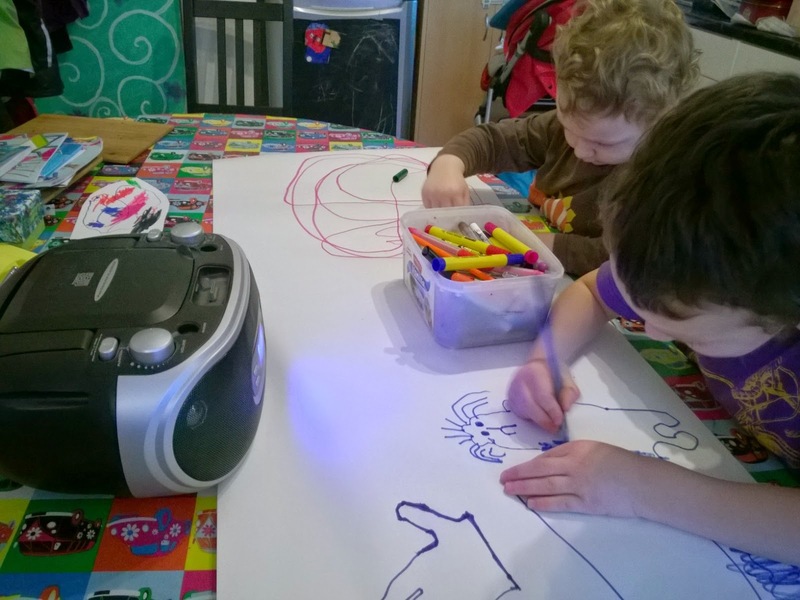 You will need music, something to play it on, and something to create a piece of art with - collage, paint, crayons it doesn't matter and you could vary the media you use each time you do the activity. Finding a good piece of music was a stumbling block for me. I knew I wanted something more atmospheric and different in feel to the usual cheery acoustic stuff I listen to, probably something more classical in style, but my previously mentioned lack of awareness of composers left me a bit stumped where to start. Enter the perfectly timed offer of a CD to review. 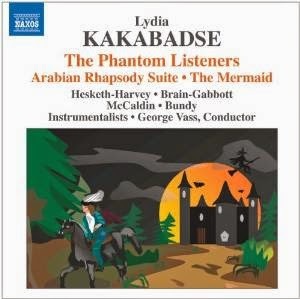 The CD, by British composer Lydia Kakabadse was everything I could have wanted for this project and more. With a diverse cultural heritage herself, this composer has created an album with a range of different influences including Middle Eastern and Russian, which is perfect as it produces a distinctive and mysterious-sounding set of pieces which are just right for inspiring young imaginations. The album, titled 'The Phantom Listeners' provided a number of different pieces to inspire us and each came with a useful guide in the CD booklet which explained what the piece was about and enabled me to get to grips with descriptions I could use to tell the boys a little about each piece. We started with a piece called 'The Mermaid' based on a story written by the composer and narrated by the rich voice of Kit Hesketh-Harvey (who you may have heard of for his musical satire 'Kit and the Widow' among other things). As we listened to the story and the music the boys drew their interpretation of what they heard, and I asked them to tell me about what they were drawing and about how the characters felt. 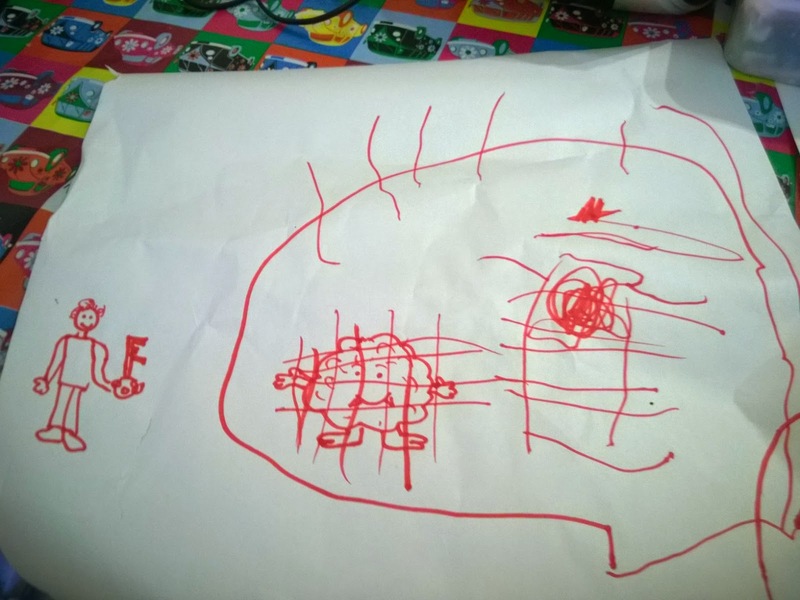 Ollie drew a very mournful-looking mermaid trapped in the net of a rather scary looking grinning pirate. In Ollie's words 'the pirate is happy because he can sell the mermaid and get more treasure, the mermaid is sad because she misses her friends and will die away from the water'. 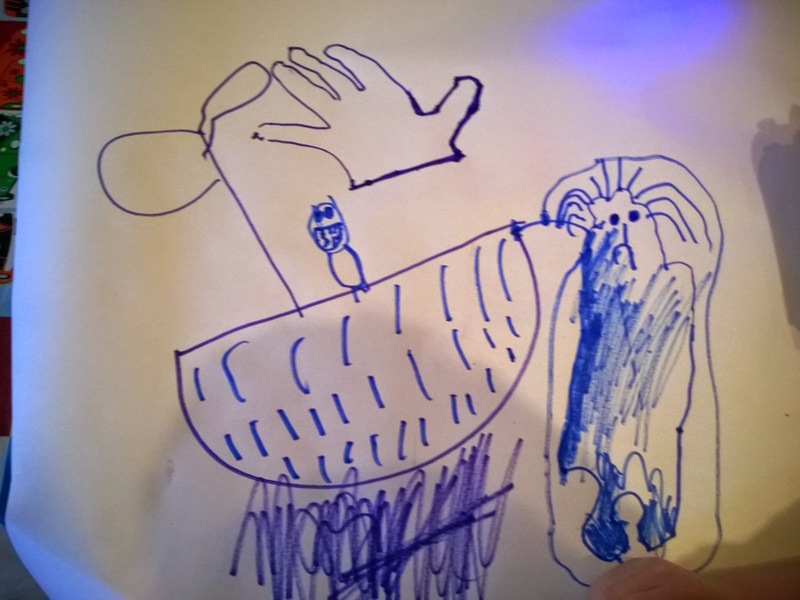 (The hand outline above the boat is a jellyfish, just because Ollie fancied drawing one). Toby's picture looks like random swirls, but when asked to tell me about it he told me 'here an island, here a mermaid, here a pirate, here an octopus, here a sea monster' when I asked him if the mermaid was happy or sad he said 'mermaid is sad'. 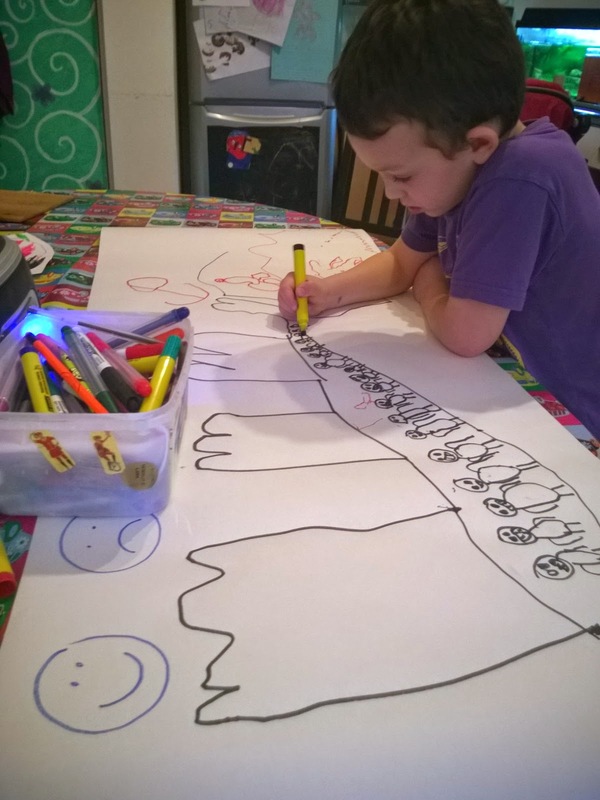 Ollie adapted his picture as the story unfolded, changing the mermaid's expression and eventually scribbling out the whole picture. It's important not to interfere too much with what your child produces during an activity like this, if they get stuck for ideas you can try leading questions like 'how does the pirate feel' or 'does this music make you think about castles or aeroplanes' but if your child wants to make the sky pink, or scribble the face off a character, it's their picture, let them. I like to take picture as the boys create things so that if they decide to paint it out or scrunch it up, I still have the steps before they did that as a record. 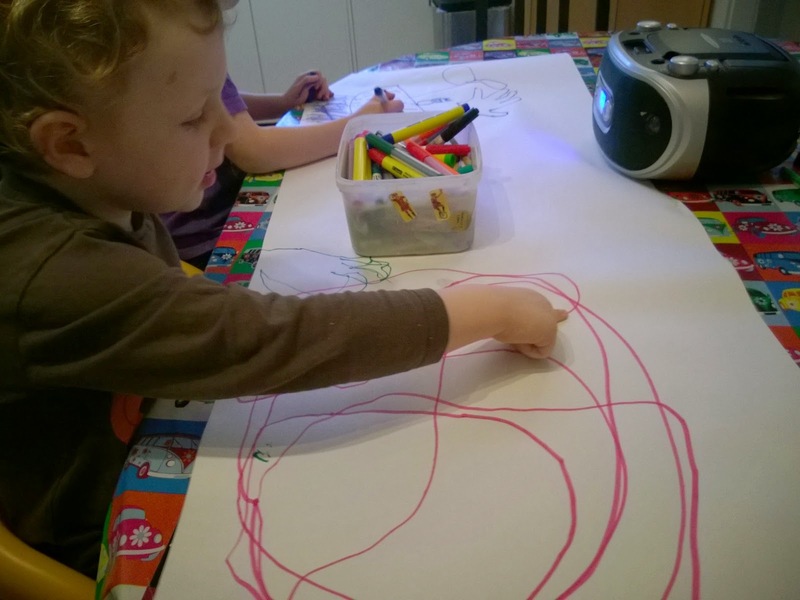 Some of the next songs had no words and were initially trickier for Ollie to respond to, so I started him off by drawing a happy face and a sad face and asking him to point to the face that was the same as the music. He picked the happy face and then started to draw and tell me a story about how the naughty pirates were now all locked up in a dungeon at a castle. He said there were twenty pirates and they were angry because they were trapped and they kept trying to fight their way out of the dungeon. Interestingly, Toby at this point wanted to climb up onto my knee and drew a castle of his own, this time with a monster locked away in it - he drew lines to represent a cage. Toby has been worried at night about monsters for the last few weeks after reading the book of the film 'Monsters University', so this seemed to be a therapeutic way he could share his fears and deal with them by locking away the monster. He went on to ask me to draw more monsters for him to 'put in cage' and a picture of him holding the key outside the castle 'so they no get out'. Art, like play, is a really good way for children to express, think about and deal with their emotions and worries. Having a strong set of music tracks like the ones on this CD was a really good way to encourage thoughts about sadness or being scared so that the boys could process their feelings in the light of day and in a safe environment and hopefully will be less troubled by them at bedtime. The boys are already used to listening to storytellers so the mixture of spoken fables and atmospheric music on this CD was a great way to bridge the gap into a new area for us. Hopefully it will lead on to finding out about other contemporary composers. I'm a CD fan as it's less faffing about than digital music, but if you're less of a dinosaur than me you can also download this as an MP3. Click on the image of the CD to find out more and listen to samples. Note: I got the CD for free to try out, but opinions, ideas and pirate drawing boys are all mine.